I am going to speak for a little while on the most difficult thing in the world, that is, faith. So far as the Lord’s people are concerned, it can be truly said that the whole of their life in every aspect – salvation in its first step and every subsequent step, spiritual growth, spiritual sustenance, spiritual victory, spiritual work and service, fellowship with the Lord and ultimate glory is all resolved into one thing and that one thing is faith. Faith is the key to everything in our relationship to the Lord. It is all just a question of faith – not faith as something in itself, but faith in God. That is something which has to be faced and as far as possible at any point, settled; but it is not a thing which is settled once and for all. There has to be a settlement made again and again on this point. We are really continually confronted with this question; in the presence of new situations and trials and perplexities and seeming contradictions, am I going to believe God or not, am I going to repose faith in Him or not, am I going to trust the Lord or not? That is true all the way along, and it always will be so. And sometimes those testings are very, very acute and severe. A brother wrote to me this week, one who has been greatly used of the Lord in other lands as well as in this one, who knows the Lord, and has a very real walk with the Lord, and he just put this in his letter. “It sometimes seems as though the Lord is a thousand miles away and has no interest whatever in me. It sometimes seems as though He has just cut me off”. You may think that is very extreme, but some of you will not. You know quite well that such experiences are true to the life of a child of God. I was saying that this is something that has to be faced. That is the life to which we are called. The Lord has not covered it, has not veiled it, hidden it from us. We are called unto a life of faith, and we had better face it; and then we must, as far as possible, if we are going to get through, settle it, for I repeat there is no step or stage or aspect of the life of the child of God from first to last, from the beginning to the end that is not a matter of faith. Well, that is a fact, and let us be quite honest about it, and quite frank with ourselves. That is the situation. It will help to a very large extent if we have looked this thing straight in the face and not shelved it, not tried to evade it, but accepted it. But we want to get inside of this matter of faith, and here in this letter to the Hebrews which is, as you know, from start to finish, a letter on the matter of faith, we have amongst others one very helpful clue and key to faith. It is in this fourth chapter. You may not think that it really is a matter of faith for it does not seem to lie on the face of it, but when you examine it, you find that that is the thing that it is touching – this strange, somewhat technical language – “For the word of God is living and active, and sharper than any two-edged sword, and piercing even to the dividing of soul and spirit”. You will notice that that statement begins with a ‘for’, and that ‘for’ links you with Israel in the wilderness failing to enter into rest. It is said that they had the Gospel preached to them, but the word spoken did not profit, not being mixed or united by FAITH. It did not profit, not being united by FAITH. Then there follows, “I sware in my wrath, they shall not enter into my rest”. They could not enter in because of unbelief. Then more about the rest and their failure to enter in, and then – ‘FOR the word of God divides between soul and spirit’. This is the key to faith, or a key to faith. What is it? It is the conquest of the soul, and that is said to explain the whole of the wilderness failure and the subsequent not entering into the rest. You know what soul is. I am not going to stay with soul and spirit very much. We know in this matter that the soul is the self-conscious life. By our souls we are conscious of ourselves and other people and all that world of things here. Spirit is just the God-conscious life. By our spirit we are conscious of God Who is Spirit, and all that realm. Self-conscious and God-conscious life, and because those two things were not defined, put apart and recognised in their difference, but allowed to overlap and bring about a state of confusion, they did not enter in. They failed because of unbelief. Well, what does that amount to? The self-conscious life predominated, and the God-conscious life did not predominate, was made subject and subservient. In other words, for them, everything was a matter of how self was affected by the situation and by the prospect. You find them again and again full of enthusiasm, full of zeal, full of what looked like real interest in the things of the Lord. Oh yes, they were going on, they were full of apparently real devotion to the Lord. But that was when the situation was pleasing them and when the prospect was presented so that it brought a great sense of possibilities for them, prospects for them, and their gratification. Oh, this is fine, this is good; tell us more about this wonderful land to which we are going, keep telling us about all its glorious wonders, and resources; go on, we are most interested in this, we are in for that! But it was all soul, self-conscious self-interest, self-gratification. And when there arose some situation, either present or in relation to that prospect which made it a matter of denying, sacrificing self, letting go self-interests, and having to face up to a very difficult situation which was going to be very costly to them, they were not so interested; their zeal went, and unbelief rose up; it was there and it rose up. They were not so concerned about this thing now, it was not now for them. What was it for? It was for the Lord ONLY first, and their interests were entirely eclipsed. They would only come into their inheritance when the Lord got His. The Lord first; “Seek ye first his kingdom and his righteousness; and all these things shall be added unto you” (Matt. 6:33), and that putting first often meant a letting go of everything personal. LIVINGWALK NOTE: Readers are strongly encouraged to read “What is Man?” by T. Austin-Sparks; to gain a practical understanding of the tripartite nature of humanity (spirit, soul and body), and how these pertain to man’s complete (past, present future / spirit, soul, body) salvation. It is very likely that you have never been exposed to such essential truths, as contemporary Christendom has largely been influenced by Freudian (id, ego, super-ego) psychology and humanistic notions of the perfection of the self. Does not that get right to the heart of this thing? What is disappointment to us? Can we always say that disappointment which we think is disappointment with the Lord and over His things is because we did so much want the Lord to have what He wanted irrespective of our interests at all; we were prepared to let everything go, WE were not mixed up in this thing somehow? In the Lord getting what He wants, we see ourselves figuring in some way. It has to be a very sharp instrument that gets in between those two things and defines them because they are so mixed up. Is it not true that faith wavers, weakens and ofttimes goes right down and under when in the way of the Lord’s interests OURSELVES are entirely shut out? What is the key to faith then? The key to faith is this dividing of soul and spirit, or, in other words, it is the complete abnegation of self-interests – not in the Buddhist sense of annihilation, but in the sense of God’s interests becoming positive and predominant. That is where the battle of faith rages; it rages upon that ground always. If we were so utterly – and not one of us really is – if we were so utterly consumed for the Lord’s interests alone that no other interest in our lives had any precedence or power to govern us, we would be in victory all the time. It is this completely disinterested concern for what the Lord wants that is the key to faith. If Israel in the wilderness had taken this attitude – Well, this is a very difficult experience, but the Lord is after something, the Lord wants something, and He evidently knows that that is the best way to get it; all right, I am with Him, I may lose everything, I may suffer the loss of all things, but it is what the Lord wants that matters. The Lord wants us in that land; well, if it means everything, to be there for the Lord’s pleasure, that is the thing that matters – if that had been their attitude, do you think they would have journeyed forty years in the wilderness round and round, do you think at the border of the land they would have been turned back to perish in the wilderness? You can see in the consummation, that next generation which did go in, went in on this matter of faith only. The whole story is based upon faith. There is the faith of Rahab the harlot; her faith was the key to the land – Jericho. Then there was the faith of going round six days in silence and on the seventh the shout of faith, without drawing a sword or turning a hand to do anything but go round – ridiculous! It is all such utter faith. They went up and possessed on that basis. That generation did enter in because of faith, whereas the generation before did not enter in because of unbelief. But this generation went up because Joshua and Caleb had said, If the Lord delight in us, He will bring us in (Num. 14:8). That is the matter – it is the delight of the Lord, perfectly disinterested concern for what the Lord wants, and that is one of the most difficult things in life, to get this self out of the way. So, just finally, a little word on the result of faith. First of all, of course, it is rest. We are not now thinking of some future rest, some future land, whatever our hymn writers have to say about it. You read again this fourth chapter of the letter to the Hebrews, and you see “We who have believed do enter into that rest”. Some of us have already entered in, says the Apostle. God defines a day – it is not the future – and some of us do enter in. This rest is not a time period, it is a state, and the Apostle says here so clearly that entering into rest is simply a matter of entering into a settled faith in God. You know quite well that however doctrinal and technical this may seem, it is very true. We can prove it almost any day of our lives. When we get to the place where we put ourselves and what we would like on one side and accept the Lord’s will – not just resignedly saying Well, if that is what the Lord wants, I capitulate; if I could have it otherwise, I would, but this is evidently what the Lord wants: but if with all our heart we accept it and enter into this with the Lord to co-operate with Him, when we come there, rest enters into our souls, our souls come to rest, on all sorts of things, small and great. Then victory comes because faith is power. If the Word of God is strong and clear about one thing, it is about this. Oh, faith is power. First of all, it is power with God. What is more powerful with God than to be well-pleasing to Him, and that is why I read about Enoch. “By faith Enoch was translated that he should not see death; and he was not found because God translated him: for he hath had witness borne to him that before his translation he had been well-pleasing unto God”. That is all centred in, and made to rest upon, faith. “Without faith it is impossible to be well-pleasing unto him”. Surely that is our ambition above all – to be well-pleasing unto Him. How? – to believe Him, to trust Him, to repose faith in Him, to be well-pleasing unto Him. It is power with God. We can consider that along the other line, that our weakness with the Lord is always found in our reservation, our question, our doubt, our uncertainty. That is our weakness with God, and the Lord waits. It is victory over the Devil because, if there is one thing that is the playground of the Devil, it is unbelief, and if there is one thing that the Devil is always seeking to promote and maintain, it is unfaith. The hallmark of the Devil’s work from the Garden to the end is unbelief, doubt of God, to question about God and God’s ways – and God’s motives. That is where the Devil is coming all the time – with an ‘if’. If this and if that. If God were what He says He is, then this would not be. You know the thousands of ‘ifs’ and ‘buts’ of the Devil. The only power of victory over the Devil is faith in God. We can use the language of victory and power over Satan and it counts for nothing. We must have a new position of power over the enemy. The key is faith; it may be faith in the Blood, or in the Name, or in the Lord, but it is faith. It is power over the world. “This is the victory that hath overcome the world, even our faith” (1 John 5:4). The world in this sense is that whole system and order and atmosphere and attitude of things which must have the seen, and the present. What is the mark of the world? It must see, it must have now. Anything that is unseen and not present is utterly outside of the mentality of the world, and we know how much of the world there is in our nature and the battle is there. Faith overcomes that world that is in our own natures and around us. “The things which are seen are temporal: but the things which are not seen are eternal” (2 Cor. 4:18). Faith has to do with those things. We could talk for many hours on the matter of faith. Please do not think I am laying down the law to you. God knows the battle in all of our hearts on this matter and how true we know this to be in our own experience. We simply talk to one another solemnly. We shall always have to fall down before Him and say, Lord, increase our faith! There will be many times when we shall say, Lord, I have not faith for that, I have not faith to face this, to accept this. It is a matter of a new dealing with the Lord on this question of faith. There is the fact, it has to be faced, to be settled, to be resolved again and again. Everything depends upon it – the Victory in every realm, going on with the Lord, getting through to what God has purposed. It is all this matter of faith in God, and thereby being well-pleasing unto Him. “He that cometh to God must believe that he is, and that he is a rewarder of them that seek after him” (Heb. 11:6). Lord, increase our faith! 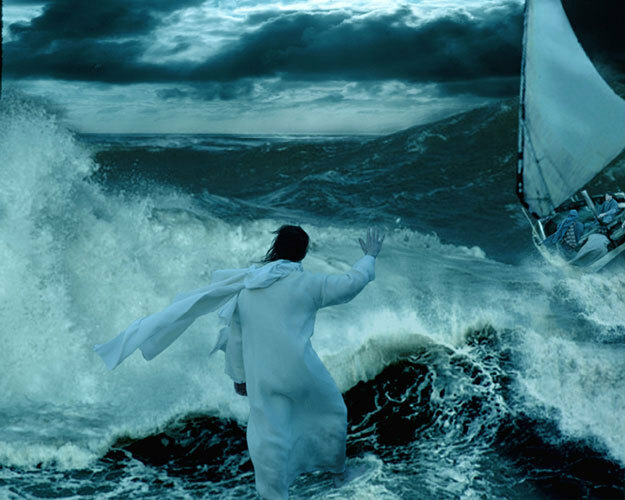 Here we see that Peter, leaving the security of the boat in the midst of the storm, did in fact walk on the water a ways. We are not told how far or how many steps he took, before giving way to the elements around him. What we are told is that he saw that the wind was “contrary” (or boisterous) and this led to fear and in turn his starting to sink. We can assume then, that while successfully walking atop the waves Peter was concentrating on something other than the “boisterous” waves, the wind, and the storm. And there can only be one object of his fixed attention and this could only be the Lord. “Looking unto Jesus –” we are told in Hebrews, “the author and finisher of our faith”. So Peter (I am one of those who strongly feels Peter is treated far too unkindly by commentators and Christians in general) started well (no other disciples asked the Lord to command them to come to Him). And he even entered into the faith of the Lord by doing what was naturally impossible to do – he, a full grown man, did indeed stride atop the waves that he knew all too well as a seasoned fisherman. He did so because, for a short time anyway, he fixed his gaze on the only One who could perform His word; one sovereign over the natural elements. And so, I started to reconsider all my concepts of faith – what it was, how it grew, what it means to our Heavenly Father and our Lord Himself. Clearly then, many of our religious notions regarding faith may in fact be confounding or distorting what is really a simple matter – fixing our spiritual eyes on the Faithful One! How does our faith grow and mature then? Not by striving after more faith. Not by fixing our attention on faith itself even. Not even solely by studying great exploits in faith by so-called champions of faith (although this can certainly be most encouraging). He is the beginning, the source, and the fulfillment of faith, yet He is also the object of it; what faith looks to. Peter knew the waves and the sea all to well. He had been tossed and turned by its swells and moods all of his life. He had no doubt looked long at the heaving tides that surrounded that little boat. He knew all too intimately the wind and storm too no doubt; the often fierce and unpredictable tyranny of the elements on the Sea of Galilee. We too, my friends, know this world all too well, how it moves and turns and tosses us about, and we have all, over the course of our lives, devised soulish ways of responding to it – instincts, habits, patterns, routines – based on all that we are and have become in this life. Faith, as I am slowly coming to learn, is simply turning our attention; fixing our eyes on Jesus – the Way, the Truth and the Life, the Author and Perfecter of Faith, the Beginning and the End of all the plans and purposes of the Most High God. Then faith is release; releasing all of our cares and concerns and well-being (both spiritually and physically) into the hands of He alone who is faithful and steadfast. Oh brethren, that we would learn the wonderful secret of letting go, of releasing all that we are to the Captain of our Souls! Pray that the Lord God would help you to release everything unto Him – thoughts, notions, arguments, weaknesses, ideas, assumptions, strongholds, habits, experience, history, hurt, pain, earthly wisdom – everything in fact that confounds and limits His divine purpose in us. We must leave the boat – everything that represents security and safety and familiarity in this world and in ourselves – in order that His life would be released and enlarged in us. And it is faith that moves us to ask Him to come to Him, to stand up, to step out, when everything in us screams that we will go under; that it is absurd for a man to think he can walk on the water. It is vital to recognize that the Lord cannot hope to establish His Son in us until He alone becomes our true ground. This requires the continual testing of our faith and the stepping out into Him upon whom we must stand and walk. There is in this a constant leaving behind of all that represents “false ground”; the boat in other words, or anything else that we trust in to keep us safe and secure in this world. Where there is faith, there will always be a proving of that faith, to enlarge the Lord Jesus as our confidence and life. Do you see this dear saints? Oh Lord, bring this home to your little ones in this hour. Now saints, we cannot work to attain greater faith – we must come to rest solely and intimately in the only One who is faithful. Praying for increased faith is fine, but we must understand how the Father might respond to this prayer – by removing all else that we trust in to hold us together in this world; like Peter’s fishing boat for example. It is the Father’s will that all be lost that we would gain His most precious gift – His Son. For what can a man hold onto while walking on the boisterous sea? For what will secure his footing atop the waves? He can reach out, but truly there is nothing there; nothing that is but the Lord Himself. This is precisely how the Father increases our faith through His Spirit, as He draws us out of our safe and familiar surroundings in our lives and places us in situations where all we have is His Son. Are we then being tested and tried? Are the waves of hardship, loss, reduction and persecution spilling over into our little boat? Is our first temptation and response to fix our attention on the storm and the swell, the noise and the uncertainty all around us, and even how small and insignificant we are in the midst of it? These are certainly fearful and uncertain times dear brethren, times of wind and storm, and I certainly do not wish to negate how difficult daily life is becoming for many of the Lord’s people. And if my sense of the prophetic moment is anywhere near to being correct, then things are poised to get a whole lot worse before they get better. The disciples, having set out ahead of the Lord (it was He who sent them on ahead without Him, indicating that this whole ordeal was a God-ordained training exercise), had to learn a lesson that we too must learn, and it is that He will never leave us nor forsake us. Though He was not physically with them in the boat, they were not left alone to their own doom, destiny and devices. For He was there with them in the midst, and even above the storm; there almost in view, “like a ghost”, but certainly no mere apparition or shadow, but the “substance of things hoped for”. Interesting, brethren, that faith and substance (or assurance) are here associated together, for it would appear on the surface, that faith would be opposed or contradictory to substance (or the possession in hand of the thing in view). I personally have always assumed that to touch and see is superior to belief; that faith was less than sight. Yet apparently, the Lord wants us to see that this is in fact not the case, and that our faith in His Word (both the Scriptures and the Living Word made flesh) is something He takes very personally. Dear brethren, children of the day, please pray for one another in these fearful times, that we would show forth our Lord in all His fullness and love to one another, as He cares for His Body, and brings us all to that state of readiness and maturity in faith that we know must be His will. Encourage and uplift each other, dear brethren, in the Spirit and in the Faith, whenever and wherever you have opportunity, for the days are short, and His Kingdom will soon be upon us. Exhort and admonish one another in the faith, to true steadfastness and endurance, looking to the prize of our upward calling that is out ahead of us, and not to the storm and swell that encompasses us in this hour. Gracious and Wondrous Father, Lord of all life and strength and victory, please help us, Lord, to fix our attention on He who is the Substantial One, the Faithful One, who loved us and gave Himself for us, and who has promised us so great a future in His Kingdom. Though the wind and the storm swells all around us in this dark hour, and though each of us is being tried and tested in each our own way, help us not to suffer the natural temptation to fixate and focus on circumstance, environment or any other consideration that takes our eyes off of Him. Thank you, Lord. In Jesus glorious name, we pray. Amen.